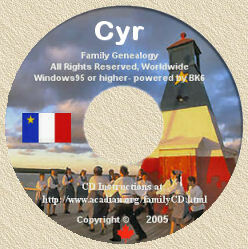 Acadian Genealogy Homepage; St. John Valley! St. John Valley; A Travel Artery over 200 years ago! It is most probable that the Indians were the first to inform the French about Madawaska. Champlain knew something about this region in 1612, since his maps show the location of the Madawaska River and Lake Temiscouata, without indicating them by name. Many Europeans had already traveled in this area. The Recollet missionaries with Jacques de la Foye, Louis Fontier and Jacques Cardon had traveled through Madawaska from Port Royal to Quebec, while navigating the St. John, St. Francis and Riviere-du-Loup. Feudal grants were made as early as 1683 to several French people, Madawaska being one of the land grants conceded to them. A large number of travelers crossed the Valley during the war between England and France. Both countries fought for the supremacy of Acadia and Canada between the years 1755 and 1760. It is then that Madawaska became the link between Acadia and Canada. In 1756, there were two French post offices in the Madawaska Territory...one in Grand Falls, New Brunswick (where I was born) and Lake Temiscouata, Quebec. The exodus of the Acadian people which began in 1755 by their expulsion from Grand-Pre, ended at Fredericton (New Brunswick), to begin again in 1759 when many had to flee to the St. John Valley to get away from the English Loyalists who were threatening them. Many had fled to the Province of Quebec, but when they heard that Louisberg in 1758 and Quebec the year after, had fallen in the hands of the English, these refugees pledged unconditional allegiance to England and returned to their lands. It is then that many of these repatriated Acadians stopped in St. Basil (New Brunswick) but never dreamed for a moment that 26 years later, this land was to become the cradle of a new settlement. It is the daring messengers who carried mail from Nova Scotia to Quebec, who knew well the St. John Valley which was but a forest inhabited by Indians, woods adventurers and wild animals. They carried messages under trying circumstances, hardship and danger, sometimes a distance of 600 miles using canoes during the summer, and snowshoes in the winter! The Acadian messengers made the journey in 15 days, at an average of 40 miles a day. During the War of Independence, two Mohawk Indians, enemies of England, attempted an ambush in the Madawaska River Valley to get hold of the mail, in order to sell war correspondence to American agents. They pursued one of the messengers for many days, in vain. The messenger, being tired of this man hunt, found a cabin at the mouth of the St. Francis River. Knowing how superstitious and naive these Indians were, he knew how to fool them and fill them with fear. Having eaten his supper, he began to pack his belongings to ready himself to leave the next day. Pretending to ignore the presence of the two Indians nearby, he took a large stump, the size of a man, placed it on the cot he had used to sleep, and covered it with ordinary blankets, without forgetting the traditional nightcap, then went to hide where he could watch the result of his strategy. In the middle of the night, he saw two shadows going toward the cabin. The Mohawks entered the unlocked cabin and jumped at their supposed victim. With their tomahawks, they struck with such violence that their tomahawks bounced back with a dry and ringing sound. Suspecting witchcraft, they believed that the Great Spirit had metamorphosed their victim and, seized with fright, they fled to the hills. Several years after the settlement of the Valley, J.G. Dean of Maine was sent, in 1828, to get information concerning the boundaries. Dean tells that in 1782 a boy of 14, Pierre Lizotte who had been lost in the woods of Kamouraska (Quebec), crossed to the mouth of the Madawaska River where he saw a few Indian huts. He spent the winter with the Indians and returned home in the Spring. He urged his half-brother, Pierre Duperry, to go back with him to the land he had visited, in order to establish trading posts among the Indians. In 1784, we find Lizotte and Duperry at their fur trading post near the Indian village. Duperry and Lizotte did not (permanently) settle in that village, since we find their names in the census of Fredericton (New Brunswick) taken about that time. However, they came back with the Acadian pioneers and settled in the Valley. Lizotte died in St. Basil at the age of 96 and Duperry, died in Madawaska at the age of 68. About the same time two brothers, Anselme and Michel Robichaud, merchants of Kamouraska, established a fur trading post in Madawaska. An Irishman by the name of Kelly, came to the Valley for commercial purposes, but these were itinerant merchants who never settled in the Valley until the arrival of the Acadians from Fredericton, in 1785. It was only after the American Revolution War, at the time of the coming of the English Loyalists to Fredericton, that the Acadians thought of a settlement in the St. John Valley. Strange to say, the Loyalists, who had been persecuted in the United States for being loyal to England, did not wait long before they began to work hardships on the Acadians who were the first to settle in the region of Fredericton. Threatened once more, the Acadians decided to leave their farms. Some came to Madawaska, others joined their brethren's at Memramcook, and still others went to settle on the shores of the Gulf of St. Lawrence. The above noted is re-printed with permission from the L.A. Violette family (May 3, 1979) to the Madawaska Historical Society, who subsequently granted similar permission to this author, in 1995.